Sturdy and stable to type. 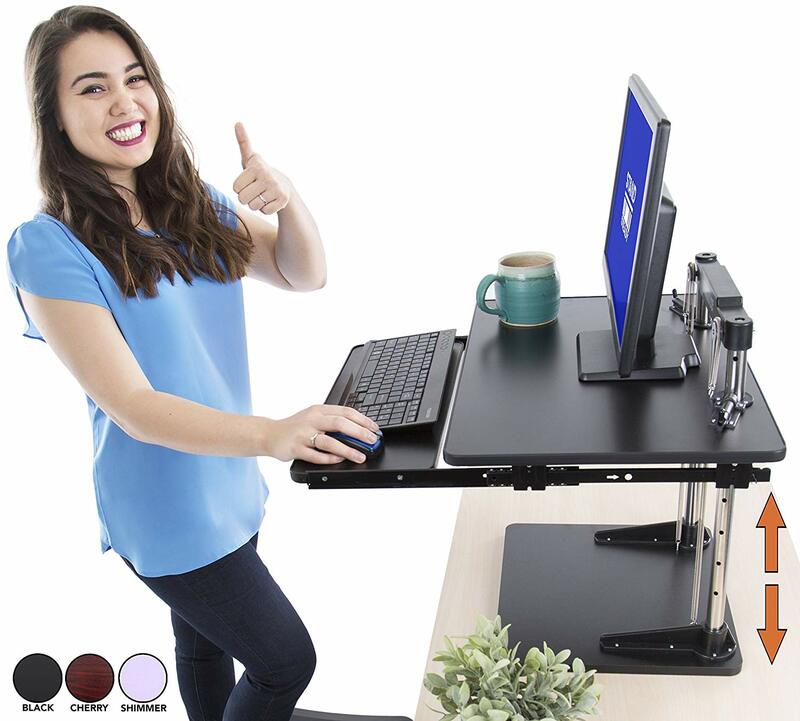 This is the summary of consumer reviews for AirRise Pro Standing Desk Converter a Adjustable Height, Two Tier. 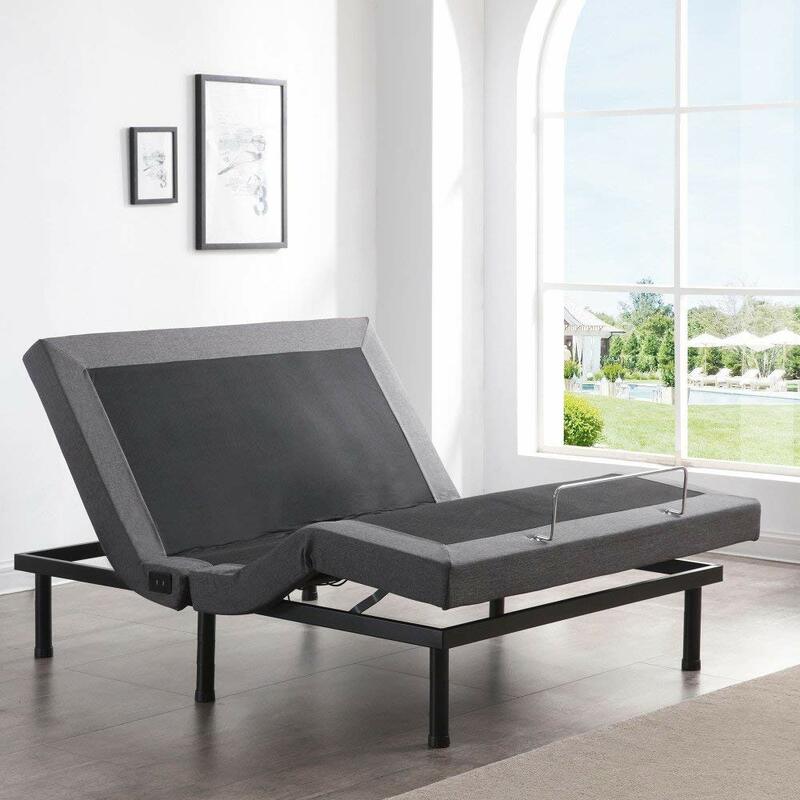 The BoolPool rating for this product is Very Good, with 4.20 stars, and the price range is $139.00-$159.00. They say sitting is the new smoking, which makes a bit of sense. If you work in an office, you are sitting down all day; your heart rate is sluggish; your back is getting messed up from a slouching posture, and you are likely snacking throughout the sedentary lifestyle. It should come to no surprise to anyone, people with desk jobs likely develop back problems or gain a little extra cuddle cushion they were not intending. That is why there feels to be a revolution in the office space. Purchasing departments have been doing an overhaul on the budgets buying adjustable sit-to-stand workstations left and right. A simple, yet genius concept, height adjustable desks allows workers a chance to do the same job only while standing. Regardless if your short or tall, these innovative products gives workers of all sizes a chance to be healthier or straighten their back. The best part is they do not even have to stay standing all day. They have the option to be comfortable; give the restless employees room to fidget! 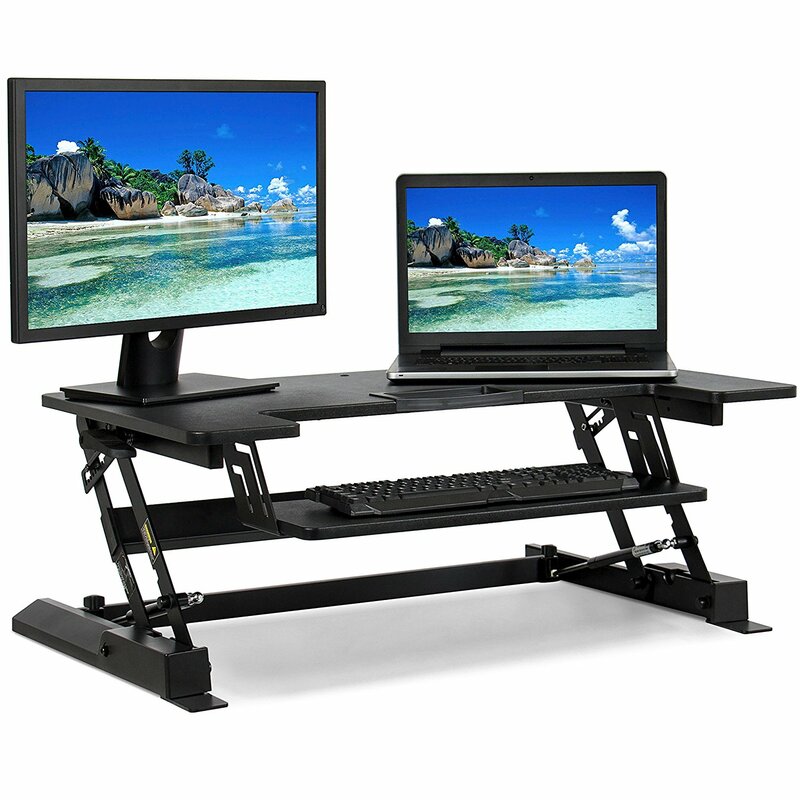 Like people, adjustable sit-to-stand workstations have various sizes. While height will rarely be an issue, the surface area can be an issue. You will want to look at your own desk and ask yourself, “How much space do I need?” Some desk risers are wide enough to hold two monitors, keyboards, mice, coffee mugs, and pictures of your mother, but can your cubicle even fit a riser that big? Others are snug enough simply for one monitor, mouse and keyboard, and your notepad; is that just, right? We’ve searched high and low for reviews of various sit-to-stand workstations, and they will help find the perfect one to fit your needs. Just keep in mind an unsatisfied review does not necessarily reflect on the desk riser’s quality. It likely means the customer needed a different kind of workstation. 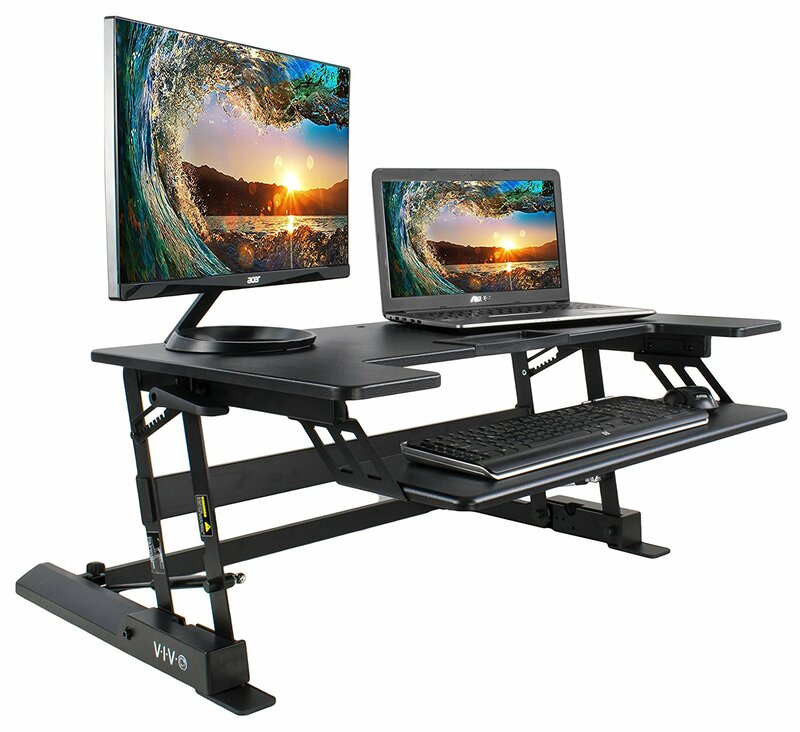 This AirRise Pro Standing Desk model is heavy duty, and most customers greatly appreciated that aspect. This sit-to-stand workstation is very spacious able to make room for two monitors, a keyboard, mousepad, and other desk knick-knacks without feeling too cramped. With all that equipment bearing down, customers were also greatly impressed with how durable the AirRise Pro Standing Desk Converter Adjustable Height, Two Tier stood against the weight. It stays at the intended height, and most of all, it does not wobble! 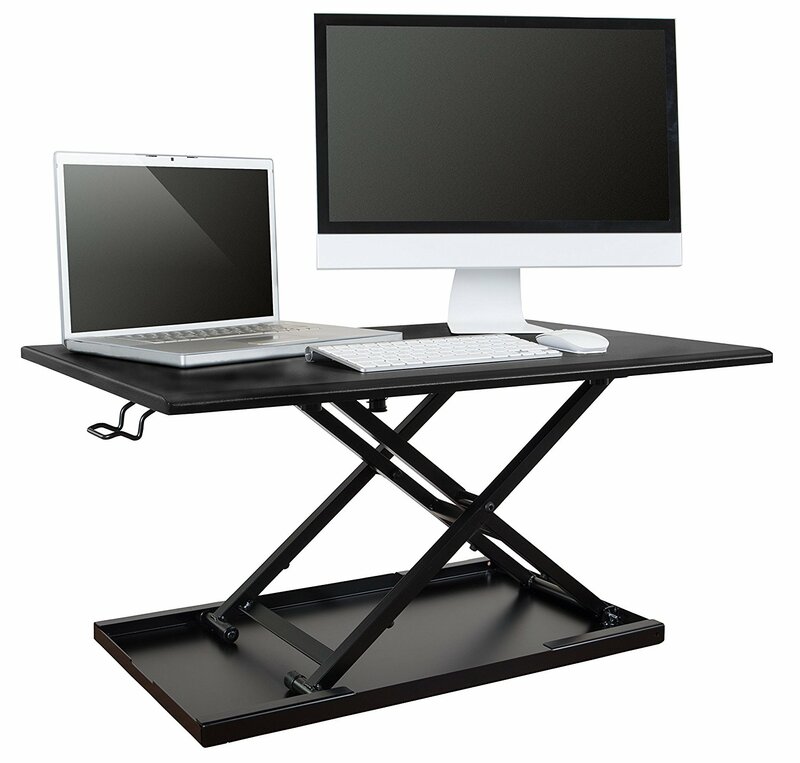 You can type on this adjustable workstation all day, and it remains stable without any shake. The drawback to this heavy duty load is that adjusting the height may be heavy to some. While the height adjusting mechanism itself may not be particularly difficult, the hydraulic function does not appear to lessen the weight of your equipment. Furthermore, the AirRise Pro Standing Desk Converter Adjustable Height, Two Tieritself is quite heavy. While there is no assembly required, moving the sit-to-stand workstation can be a daunting chore. The AirRise Pro Standing Desk Converter Adjustable Height, Two Tier is a model built to last and to perform. It is the adjustable stand for those who need multiple screens to work and for those who type hard and fast. 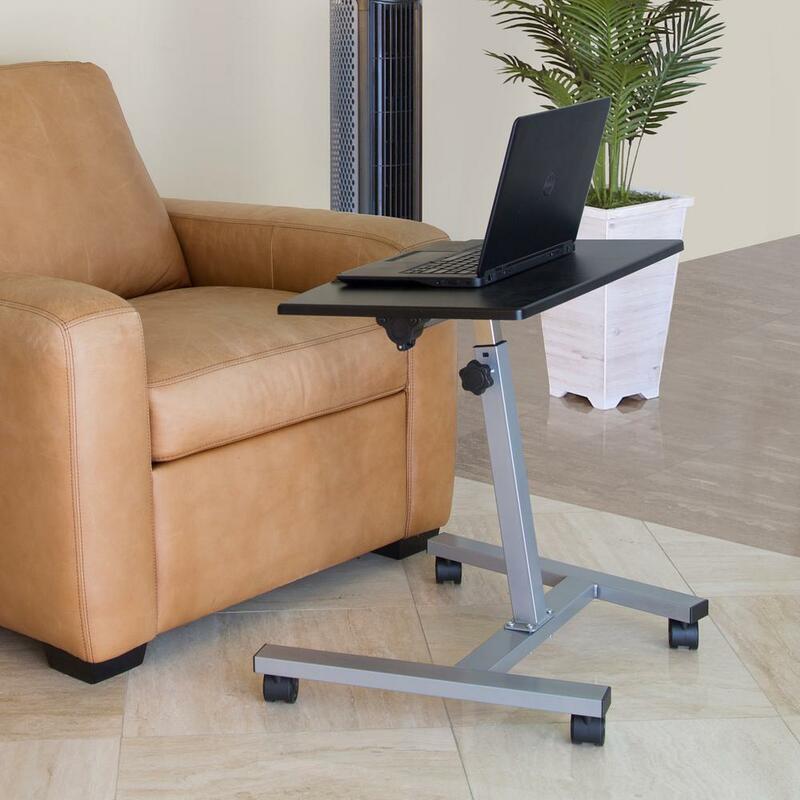 It is the sit-to-stand workstation that provides a foundation for your work area. Very sturdy and easy to move! Very sturdy, easy to move! Easy up, easy down, and sturdy to lean on in any position. It's sturdy enough in the high position, not wobbly at all. Nice, sturdy, and allows the different heights to use with my wobble stool and when standing. Heavy duty, sturdy, comes fully assembled, and is customizable to height. Very stable, sturdy and stays right where you put it. It's very sturdy, great quality, and doesn't wobble around or make a bunch of noise when writing on the surface in any position. Sturdy and adjustable, with a lot of workspace. The size is perfect: deep enough for a 17" Dell monitor + 13" notebook directly in front of it, sufficient writing space, and a lamp; but not so huge that it cramps the cubicle. But right now, everything is perfect!. I love, love, love this desk. I love love love this desk. LOVE this stand up desk. I wanted to love this because I loved the price and the reviews are awesome but...it's gotta to back. Just got this and I LOVE it! :0) Bottom line, sturdy, sleek looking desk and will match with any decor. It's super sturdy and rises and lowers easily. Love the chamfered edges and the ease of, and infinite setting position. Took me about a week or so to get use to it, but love it. Great quality, easy to use and easy monitoring. The size is great! Great quality, easy to use and easy monitoring.... size is great! the desk is easy to lift and bring down. Pretty easy to handle - I've a big monitor, so it's a bit heavy to push up, but very sturdy, secure and a good value. Solid, easy use but hard to lug around. Despite some reviews saying it's hard to lift up, I think it's pretty easy to do so with little effort. Isn't easy to put down. The switch to raise and lower it's easy to use. Very easy to switch, the extra review that someone added an extra spring I could see as useful if you're having problems. Very easy to adjust up and down as needed. It was very easy to set up as it's preassembled. Easy to raise and lower with just a little extra lift force required for the first 3 inches or so. It's so easy to raise and lower. Very easy to raise and lower the desk whenever I need to sit/stand. It's difficult to elevate and even worse to lower!! Watch your fingers because it slams shut when you attempt to lower it. I've a bad lower back, and this's still not an issue for me (the amount of force required to lift is noticeable but not excessive). I can easily lower it and raise it and I really like the large desk surface. Just make sure you're bearing the weight as you lower it because it'll crash down otherwise. After you pass this gap (up or down) it raises and lowers with ease. Allowed me to either sit or stand working. Could allowed me either sit and stand working. The extra large flat surface means I've plenty of room for a monitor (which sits on a stand), laptop, mouse/mousepad as well as a notebook and some personal items. This sit/stand converter is solid and large! I can't sit at my computer all day long and this product does the trick. When I sit down to study, I sit for over an hour and my back hurts. No more sitting for hours on end. Switching between sit and stand does take some effort, but it's hard to beat the price for a non-motorized desk riser. which allows me to have 2 standard size spiral notebooks, pen holder, mouse pad, still leftover space; it sits perfectly between 2 printers and monitor under the hutch when raised so. The best aspect on this one is how low the surface sits on my oak desk, unlike most others sitting at 5-6 inches high when not raised. 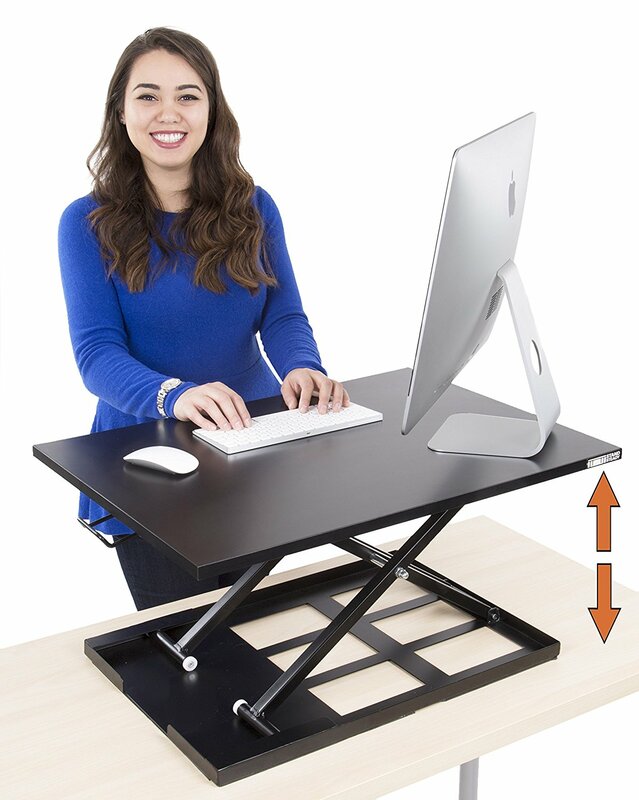 I believe that standing up more often is healthier than sitting for extended periods of time, therefore I'd recommend this product. Not enough lift for dual monitors. very nice easy up/down lift. It really needs a spring assist for lifting. A little heavy to lift on going up with all the computer stuff on it, but certainly doable. It lifts with no problem. Lifts up easily for me, but with the amount of stuff I keep on mine I could see how it may be a little heavy for some. I dragged the heavy box in the house, opened it, followed the directions precisely (open desk fully, have two people lift and place, etc.) Unfortunately, when I pulled the little lever, I'd to manually lift the entire desktop, then release the lever for it to stay put. The surface is nice and the idea is good but the desk top, with nothing on it, is somewhat heavy and it doesn't lift or lower without some substantial effort. Its sturdy and once its lifted its perfect!. Perfect and solidly built except the spring isn't strong enough to help lift the desk with anything on it as others have stated. works really well and is easy to operate. Great value at $129, works perfect to place two laptops leaving enough space for mouse and writing pad. It worked just as expected. Thing works great, holds up my computer like it was nothing - able to switch positions easy enough. i work m-f sitting at a desk all day long. The air lift allows adjustment to any height between lowest and tallest and the work area accomodates my monitor riser, laptop docking station, wireless keyboard and mouse as well as some extras like my tape despenser, stapler, tissue box, post-it dispenser, scrap paper, all those work desk 'extras'. And now I can sit or stand while at work. I use it constantly at work. This was very helpful with my line of work.